This pretty girl is Sophie. She's an 8 year old senior tricolor Harrier dog. Sophie walks very nicely on a leash. She'd would love a family that took her for walks so she could sniff, explore and enjoy the outdoors. Sophie is a friendly, gentle girl who just needs somebody to love. According to the American Kennel Club, the Harrier is a scent hound developed in England to hunt hare in packs. Though Harriers are a smaller version of the English Foxhound, they are still a sturdy, large-boned dog. Harriers excel in tracking and agility. Outgoing and friendly, Harriers are pack dogs. 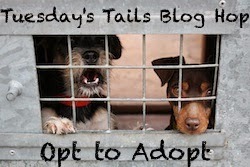 They get along well with other animals and are very people oriented. Very intelligent, Harriers can be easily trained. 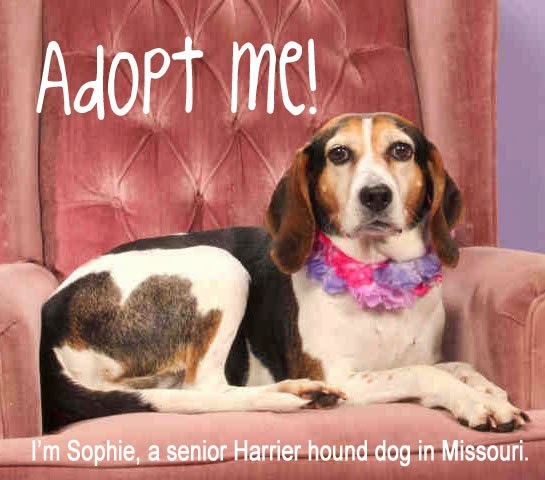 Take a look at Sophie's adoption video and then give the Humane Society of Missouri at call at 636-530-0805. Sophie is at their Chesterfield Valley animal shelter and her animal ID number is A471494. Hope she get a forever home soon. We, that is, mom and dad got a rescue age 8, in April this year. It is a wonderful age for a dog and us too. So sad to see a senior needing a home. A hound dog who walks nicely on a leash is a bonus! :) She's a beauty. Sharing. Oh what a pretty gal! Sharing. Oh my goodness her face in the video; she's so regal. She's such a pretty girl, hoping she finds her forever home soon, sharing. Sophie sure looks like a sweet cutie and we sure will share her! What a wonderful picture of Sophie! Hope she finds her perfect home soon. She is beautiful! Sharing her. She's beautiful. I hate it when seniors have to find new homes. Sharing.